FLEXspace in the News and On the Road in 2019! We’re thrilled to be featured in the latest issue of EDUCAUSE Data Bytes where we discuss the research implications of FLEXspace 2.0. Read more at EDUCAUSE Data Bytes. After a successful launch of new features at the recent ELI19 conference in Anaheim, the FLEXspace team is on the road in 2019 with various sessions and workshops so please join us! 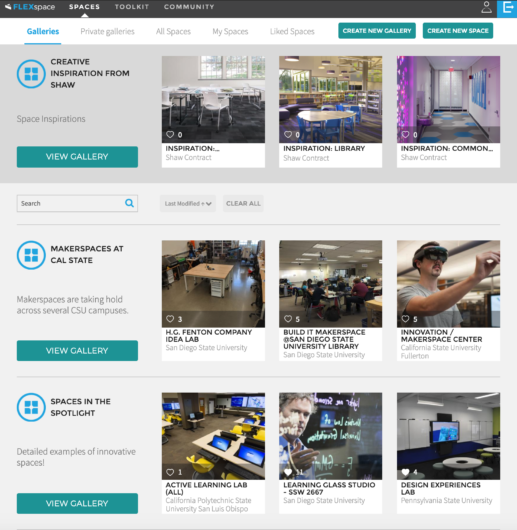 Add your spaces to the FLEXspace collection before these events and we can feature your campus contributions in our new Galleries! Spaces for the Esports Craze – Are you ready?! International differences – Spaces or Environments? What do you think? Sharing the best thinking in learning space design for higher ed, K-12, libraries and museums around the world.